Bill and Hillary Clinton get paid a lot of money to talk. The Democratic power couple earned just over $6.7 million in speaking fees last year, according to their 2015 tax returns released on Friday. It's their top money-making activity by far. Over 60% of the Clintons' $10.6 million income comes from speeches. The Clintons are millionaires, thanks to big businesses paying them sizable sums to speak at corporate events. It's a great way to make money, but it also comes with questions about whether the Clintons are too tied to corporate cash. The 2015 tax documents from the Clintons don't specify which businesses paid Bill and Hillary to speak. In the past, Wall Street has frequently paid Hillary to speak. Bernie Sanders, her democratic rival for the presidential nomination, challenged her to release video or text of the speeches she gave to big business. She never did. "Nothing will change until we elect candidates who reject Wall Street money," a Sanders ad said, directly hitting Clinton. Hillary clearly dialed back her paid speaking activity last year. She earned only $1.5 million. That's way down from the $10.5 million she garnered from speaking fees in 2014 and the $9.7 million she made in 2013. Her typical speaking fee is $225,000, which means she probably gave six or seven speeches before announcing her intention to run for president in April 2015. Bill also appeared less frequently on the speaking circuit last year. He earned $5.25 million in fees. That's lower than the $9.7 million he earned from speeches in 2014 and the $13.2 million he received in 2013. 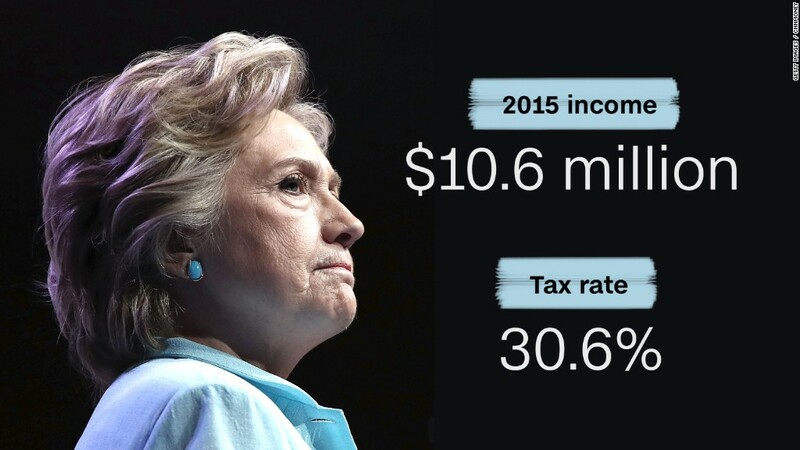 The Clintons have released many years worth of tax returns, but 2013 was the only year they provided a detailed list of where they gave paid speeches. Wall Street firms UBS (UBS) and Goldman Sachs (GS) paid both Clintons to speak that year. Donald Trump is also trying to make it a campaign issue, picking up where Sanders left off, but the Clinton campaign is seeking to squash it. "That's a non-issue," political strategist Maria Cardona told CNN Friday. She says there's nothing anyone can point to showing that these speeches influenced Clinton's policy decisions and votes.